2017 is practically in our rear view mirror, and so I’m toasting you with a homemade shot glass. Here’s to 2017 and an even better 2018. My shot glass, by the way, is made of cookie dough and hardened chocolate, one of the top food trends of this past year. (It didn’t get quite as much attention as rainbow bagels and mermaid cakes, but nonetheless, there were plenty of Milk and Cookie Shot Glass viral videos!) In fact, these fun drinkable treats have become so popular, that baking empire Wilton has created a Sweet Shooters Cookie Shot Glass Pan Set, which makes the process a whole lot easier. (Look for it on Amazon.com) You can also use metal popover molds or the popular silicone molds found at cake decorating stores and craft stores. 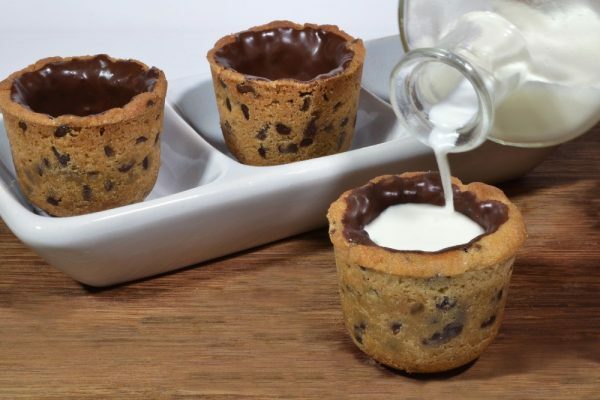 For everyday cookie shot glasses, milk or chocolate milk gets poured in. But for New Year’s Eve, might I suggest a shot of such as Frangelico, Amaretto, Nocello, Bailey’s Irish Cream or Kahlua? So, for all of you chocolate lovers, we end the year as addicted to the stuff as we started. I raise my shot glass to you and to another year of cocoa-liciousness. Preheat oven to 350 degrees. Grease the molds. (Can be small stainless steel molds, popover molds, or silicone molds.) In a large bowl, cream together the shortening and brown and granulated sugars. Add the egg yolk and vanilla extract, and mix well. Slowly add the flour and salt, and mix until completely incorporated. Add the mini chocolate chips, and mix together until evenly distributed. The dough should be a slightly crumbly. Pack cookie dough around the inside of the mold making a about a 1/4 inch wall of dough. Chill for 30 minutes. Bake for about 20 minutes or until the cookies just start to brown. Remove from the oven, and let cool completely. Melt dipping chocolate and then pour into the well of each cookie. Roll cookie shot glass around to coat the inside of cookie, and the pour the excess back into bowl. Chill cookie shots in refrigerator for about 10 minutes or until the chocolate has set. Pour milk into shot glass and serve! Makes 12 shot glasses.